If you're designing a small kitchen, it’s really important to choose the right-sized tiles to make it feel as big and bright as possible. But it's not just about size: dark tiles used in the wrong part of the kitchen can make it feel smaller. Conversely, tiles that reflect light are a great way to make the kitchen feel lighter, while laying floor tiles diagonally can make it look wider and longer. Another trick to make a small kitchen feel bigger is to use the same wall and floor tiles. Rectangular tiles laid vertically will make the room appear taller; lay them horizontally and the room will seem wider or longer. Colour is also an important factor: using a colour palette that seamlessly flows from the tiles to the units will create a cohesive look. 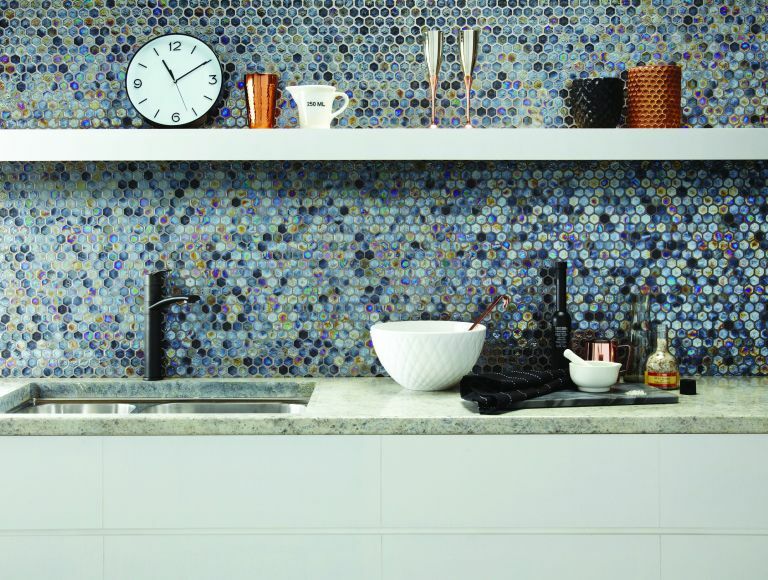 If your units are white then use pops of bright mosaics as a splashback or under units to add personality. When you want more practical tips, check out our guide to choosing the best kitchen tiles. And if you are looking for literally anything else kitchen related, guaranteed we have got it covered in our ultimate guide to planning and designing a kitchen. If you choose splashback tiles for your kitchen that tone with the colour of your kitchen units, you'll create a space that looks bigger than it would with a colour contrast. Laying them in a grid pattern like this creates vertical and horizontal lines that conjure up a visual trick of their own: making the space they occupy feel larger. Stone Rosa Perlino tumbled marble, 50cm x 75cm, £93.87 per m2, Mandarin Stone. If you are planning of tiling your splashback yourself make sure you read our step-by-step guide first. If you've fallen for a dark-coloured wall tile, see if you can find it in a finish with a reflective quality. Any material that reflects light will create an impression of space. Kandy Ash hexagon mosaic 4, 28cm x 29.5cm, £145.20 per m2, Tile Giant. Want to make all your rooms feel lighter? Find out how in our tips for brightening north-facing rooms. Laying tiles diagonally – or choosing grid-laid tiles with a diagonal pattern – is another easy way to create the space-stretching visual trick, perfect for a limited area of splashback that you want to feel larger. Parisienne Rosie patterned tiles, 20cm x 20cm, £79 per m2, Stone & Ceramic Warehouse. Remember what we said about choosing tiles that tone with cabinets? If you match their colour to that of the wall behind as well, you'll create that important space-stretching effect you're after. On a budget? You could always paint your tiles to match your kitchen walls, it's really easy, just check out our guide to painting tiles. Another colour trick? Putting dark colours below waist/cabinetry/dado level and light colours above will help make a small space feel larger. These dark tiles are in the perfect spot, plus their sparkly finish reflects light, adds depth and interest, too. Win win. Ice white rectified gloss glazed tiles (walls), 60cm x 30cm, £27.95 per m2; Orabella mosaics, 29cm x 28.5cm, £301.90 per m2, Original Style. With the diagonal tile-laying trick in mind, the herringbone pattern will work the same trick and give you an on trend look. This pattern tends to be busy, so pick toning tiles rather than ones in contrasting colours for a small kitchen. Moss handcrafted metro tiles, 25cm x 5cm, £36.95 per m2, Walls and Floors. In a large kitchen you can get away with splashing pattern on both walls and floors; in a small kitchen, it's vital to keep pattern to one area only if the room is to feel spacious. We have loads more advice on choosing tiles for small kitchens in our dedicated guide, be sure to check it out. Mezzo Nocturne cement-effect tiles, 20 x 20cm, £69.95 per m2, Original Style. Remember the diagonal tile trick (again)? It works great on walls, but it has even more impact on kitchen flooring, lengthening and widening the entire room (visually, at least). Luka black matt wall and floor tiles, 33.1cm x 33.1cm, £32.85 per m2, British Ceramic Tile. Just as it does for the walls, a herringbone pattern on the floor creates lines that draw the eye outwards, making the kitchen floor look wider and longer. The benefit of choosing a gloss finish tile, too? Reflected light makes the room feel bigger and brighter. Dwyran porcelain tiles, 10cm x 20cm, £27.50 per m2, from the Regional Reflections range, Topps Tiles. Sometimes you don't need to work magic with visual tricks and reflective surfaces – choosing a bold, brightly coloured or beautifully patterned splashback tile can create a feature wall that draws the eye. That alone can make the room's proportions negligible. Inspired to go bold with your splashback? Just check out these stunning splashback ideas. You can use tile designs to make a narrow kitchen feel wider – simply create subtle bands in horizontal lines across walls. You can create a similar trick with vertical lines – in this case making the room feel taller. Keep the contrast between the tiles minimal; anything too overpowering will have the opposite effect.